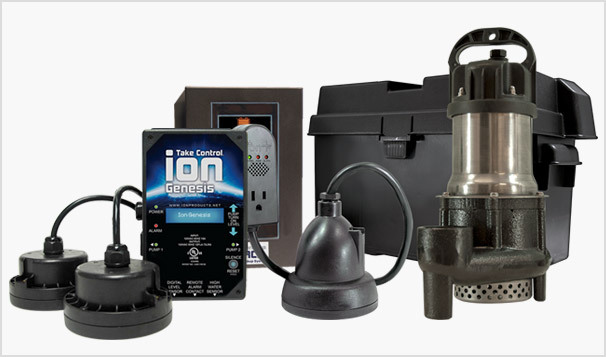 Our line of pumps, controls and battery backup systems, branded under the Ion Technologies umbrella, provides complete all-in-one solutions that protect basements from the devastation of flooding. The spirit of the Ion Technologies brand is the result of our our endless effort towards utilizing newly available technology to develop innovative solutions that enhance the capabilities of flood control. Our vast variety of pumps are equipped to handle the most challenging storm and sewage water issues. With complete integration capabilities with our state-of-the-art control and monitoring devices, our pumps have the capabilities to communicate real-time status updates and alerts. Our line of high performing battery backup systems achieve the highest pumping capabilities while maintaining the most efficient designs. Ion Technologies offers plumbers and contractors no shortage of options when it comes to providing homeowners with a workable plan that protects their basements from the devastation of flooding. Interested in learning more about the capabilities of the Ion Technologies product line? Please continue onto the Ion Technologies website to view their extensive product offerings, for distributor information or to find a certified installer.